As an intern at 21 Acres, I am trying out some of the products in the Marketplace. This product captured my attention because it is exclusive to 21 Acres. 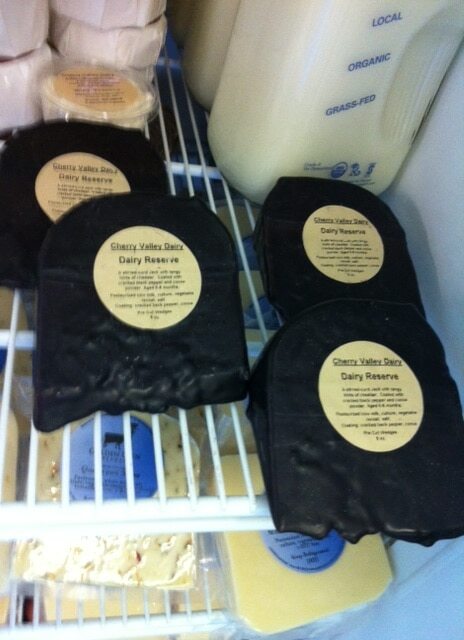 Cherry Valley Dairy Reserve cheese is crafted by Cherry Valley Dairy in Duval. It is an artisan cheese that is rBST free and described as a “stirred curd Jack with hints of cheddar.” My taste buds expected the commercial jack cheese that is rubbery and tasteless. I wasn’t expecting the creamy, nutty flavor of this handcrafted wedge, which is coated in cracked black pepper and cocoa powder and wrapped in natural beeswax. This cheese is ideal for a picnic along the slough, or an outdoor evening concert, if you can make it out of the parking lot without consuming the entire wedge! Cherry Valley Dairy uses sustainable practices in the crafting of their cheeses and dairy products. Note: We just received news that Cherry Valley Dairy took second place in the category “Monterey Jack with Flavor Added” at the American Cheese Society gathering in Madison, Wisconsin. The wheel that won was a beautiful carrot-nasturtium reserve. Two other Washington Cheesemakers brought home ribbons: Beechers for their Flagsheep cheese, and Kurt Timmermeister’s Dinah’s Cheese, a Camembert. Find Cherry Valley Cheese at the 21 Acres Farm Market! ApresVin, a small family owned company in the Yakima valley, produces grape seed oils which are cold-pressed from the seeds left over from grapes in the winemaking process. This culinary oil can be substituted for olive oil in salad dressings and marinades and has a high smoke point making it an excellent oil in frying and sautéing. With yellow wax beans and peaches fresh in our marketplace, try the ApresVin Riesling oil recipe: Green Beans with Riesling Peach Salsa found on their website, www.aprevin.com. This recipe is a creative way to celebrate fresh summer flavors. Other ApresVin grape seed oils that you will find in our marketplace are: Chardonnay, Chardonnay Provencal, Mint Chardonnay, Roasted Garlic Chardonnay, Chardonnay fume, Chipotle Merlot, Cabernet Sauvignon, Cabernet Poivre and Melange a Trois.